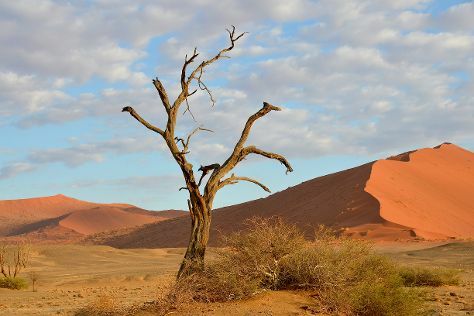 Take a break from the city and head to Sossusvlei and Namib Desert. Change things up with a short trip to Sesriem Canyon in Sossusvlei (about 1:25 hours away). Next up on the itinerary: get outside with Deadvlei. 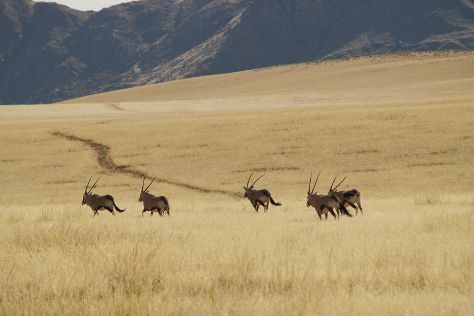 To see traveler tips, where to stay, more things to do, and more tourist information, go to the Namib-Naukluft Park trip builder. London, UK to Namib-Naukluft Park is an approximately 26-hour flight. You'll lose 1 hour traveling from London to Namib-Naukluft Park due to the time zone difference. Finish your sightseeing early on the 17th (Mon) so you can drive to Sesriem. Sesriem is a small settlement located in the Namib Desert, in Namibia, close to the southern end of the Naukluft Mountains. On the 18th (Tue), soar above the sights with a balloon tour. To find ratings, other places to visit, photos, and other tourist information, refer to the Sesriem trip generator. Traveling by car from Namib-Naukluft Park to Sesriem takes 2 hours. Wrap up your sightseeing by early afternoon on the 19th (Wed) to allow enough time to drive to Luderitz. Start off your visit on the 19th (Wed): kick back and relax at Agate Beach. To find where to stay, traveler tips, photos, and other tourist information, you can read our Luderitz tour planner. Getting from Sesriem to Luderitz by car takes about 8.5 hours. April in Luderitz sees daily highs of 29°C and lows of 15°C at night. Cap off your sightseeing on the 21st (Fri) early enough to travel to Otjiwarongo. 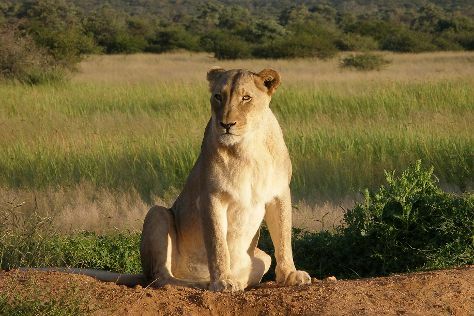 Take a break from the city and head to Okonjima Game Reserve and Mundulea Nature Reserve. There's more to do: look for all kinds of wild species at Africat and tour the pleasant surroundings at Waterberg National Park. To find more things to do, traveler tips, photos, and more tourist information, read Otjiwarongo trip itinerary planner. You can do a combination of flight and car from Luderitz to Otjiwarongo in 4.5 hours. Alternatively, you can drive. Traveling from Luderitz in April, you will find days in Otjiwarongo are a bit warmer (34°C), and nights are about the same (17°C). Wrap up your sightseeing on the 24th (Mon) to allow time to drive to Omaruru. Omaruru is a city and constituency in the Erongo Region of Namibia. Kick off your visit on the 25th (Tue): savor the flavors at Kristall Kellerei and then soothe aching muscles at some of the top local wellness centers. To see photos, reviews, other places to visit, and other tourist information, you can read our Omaruru trip builder. Traveling by car from Otjiwarongo to Omaruru takes 1.5 hours. 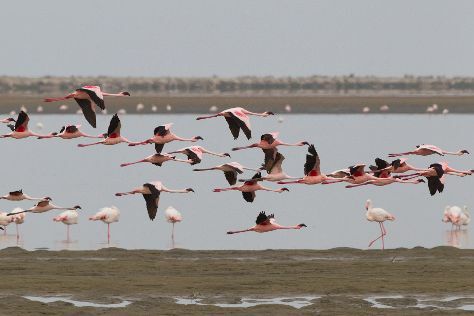 Wrap up your sightseeing on the 25th (Tue) early enough to drive to Walvis Bay. German Evangelical Lutheran Church and Swakopmund Museum are good opportunities to explore the local culture. Take a break from the city and head to Long Beach Leisure Park and Dune 7. There's still lots to do: browse for treasures at Peter's Antiques, take an exotic tour of a safari tour, look for gifts at Kristall Galerie, and meet the residents at National Marine Aquarium of Namibia. To see ratings, reviews, photos, and other tourist information, refer to the Walvis Bay tour planner. Traveling by car from Omaruru to Walvis Bay takes 3 hours. Alternatively, you can take a shuttle; or take a train. In April, plan for daily highs up to 30°C, and evening lows to 16°C. Cap off your sightseeing on the 29th (Sat) early enough to travel to Windhoek. Get a sense of the local culture at Trans-Namib Railroad Museum and Katutura Township. Take a break from the city and head to Fish River Canyon Nationalpark and NamibRand Nature Reserve. Next up on the itinerary: tee off at Omeya Golf and Residential Oasis, take in nature's colorful creations at Parliament Gardens, identify plant and animal life at Daan Viljoen Nature Reserve, and stroll through Zoo Park. To find more things to do, maps, and tourist information, refer to the Windhoek holiday planner. Traveling by combination of flight and car from Walvis Bay to Windhoek takes 1.5 hours. Alternatively, you can take a bus; or drive. In April, daytime highs in Windhoek are 32°C, while nighttime lows are 15°C. Wrap up your sightseeing on the 2nd (Tue) early enough to travel back home.